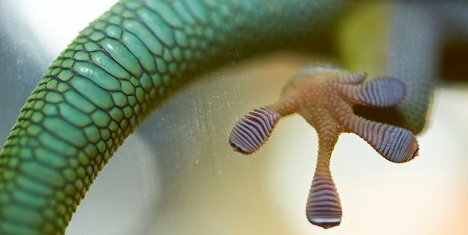 Gecko feet have fascinated materials scientists for decades. 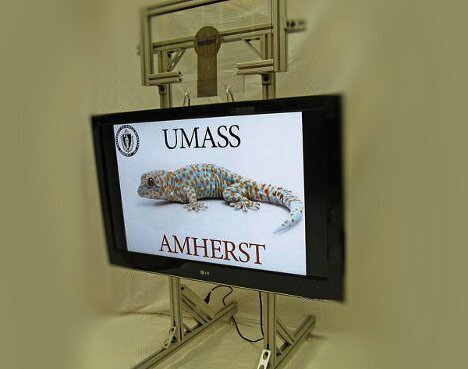 Their amazing non-slip sticking power has inspired a team from the University of Massachusetts to invent Geckskin, an extremely powerful reusable adhesive that leaves behind no sticky residue. The device is 16 inches square and can support up to 700 pounds on a smooth surface such as glass or a wall. 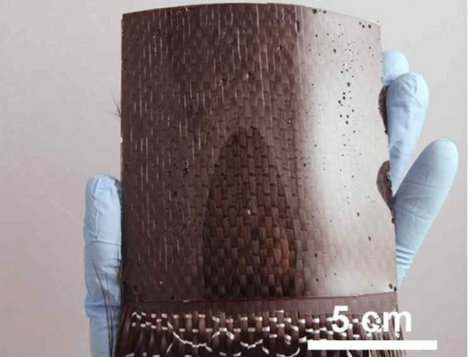 The square piece of Geckskin is woven like a stiff piece of cloth and it’s flexible to maximize surface contact between the wall and the object being stuck to it. No exotic materials were used in making it, just regular chemicals found in any lab – making it possible to develop and market the adhesive for an affordable price. Some of the biggest selling points have to do with Geckskin’s ease of use. It requires very little effort or force to remove an object from the adhesive, and one piece can be reused over and over without any loss of function. The research was funded partially through DARPA, so it could be interesting to see what types of crazy spy gadgets they eventually use Geckskin for.